Rich pipeline that is progressing well Mereo BioPharma acquired three products from Novartis in 2015. Effective in-house expertise in bone and musculoskeletal, respiratory, and endocrine diseases has resulted in commendable execution of the development programmes. 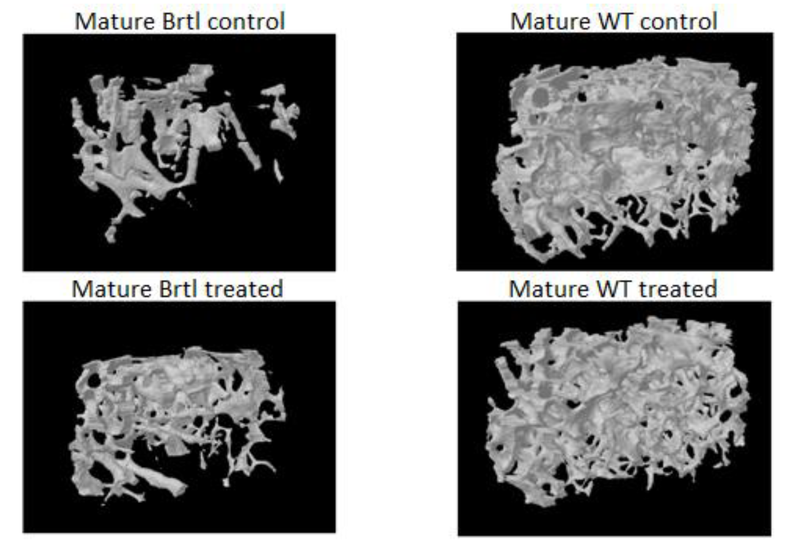 Impressive Phase II results have been reported for BGS-649 and BCT-197, and initial data from the Phase II trial in osteogenesis imperfecta (OI) with BPS-804 is due in H119. MPH-966 was in-licensed from AstraZeneca in 2017 and the first patient was recently dosed in the Phase II study in AATD. Clear focus on rare diseases Mereo BioPharma plans to commercialise BPS-804 in OI and MPH-966 in AATD itself, and to out-licence BCT-197 (acute exacerbations in COPD) and BGS-649 (testosterone deficiency). Interest has already been shown in the latter programmes, especially BCT-197, which the company is optimistic about partnering by the end of 2019. Funds from any deal will be used to support the development of its rare disease assets, including additional in-licensed products. Proposed combination with OncoMed fulfils strategic need Management believes a visible presence in the important US market will aid sourcing clinical programmes from both US-based multinationals and smaller domestic players. The proposed combination with OncoMed Pharmaceuticals brings US infrastructure and expertise, knowledgeable investors, and a NASDAQ listing. At close, likely late-H119, the target is net cash of $38m, which extends the runway into 2020. Previous rNPV valuation was 615p/share Our forecasts and valuation are placed under review until the transaction progresses. For reference, our prior rNPV-based valuation, employing conservative assumptions throughout, was £510m, equivalent to 615p a share (fully diluted). Mereo’s existing cash position, and our previously expected cash burn, enabled the company to operate through to late 2019. Mereo BioPharma is a clinical-stage biopharmaceutical company focused on rare and speciality diseases; the smaller indications will be self-commercialised and the larger ones out-licensed. It was created in 2015 to exploit opportunities arising from large pharmaceutical companies rationalising development portfolios or altering their strategic priorities. The maiden deal in 2015 saw Novartis take an equity stake (19.5% of the company) with a subscription agreement for additional shares in return for three clinical programmes addressing diverse niche indications. In 2017, a product candidate was licensed-in from AstraZeneca, with the option to acquire following results from a clinical trial. We believe the existing infrastructure can support between 5 and 7 clinical programmes. Mereo BioPharma listed on AIM in June 2016. Over £125m has been raised in equity since inception and it has a £20m debt facility with Silicon Valley Bank and Kreos Capital. The main shareholders are Woodford Investment Management (41.9%) and Invesco Asset Management (26.9%). In April 2018, management explored a listing on NASDAQ to raise investor and corporate awareness in the US. In December 2018, Mereo announced a proposed combination with OncoMed Pharmaceuticals through the issuance of c 23.7m new Mereo shares (in the form of ADRs). The consideration of $57.4m (based on the Mereo share price of 190p at close on 4 December 2018) represents a 34% premium to OncoMed’s market cap of $42.9m on 4 December 2018. The deal is anticipated to close in H119, with a final ownership split of approximately 75% Mereo:25% OncoMed. We believe an rNPV model to be the most appropriate way to value Mereo BioPharma. We build a risk-adjusted DCF model of each clinical programme, and net the sum against the costs of running the business and net cash/debt. Whilst the proposed OncoMed Pharmaceuticals transaction is underway we are placing our valuation under review. For reference, our prior valuation, based on conservative assumptions throughout, was £510m, equivalent to 615p a share. Our forecasts are being placed under review whilst the combination of OncoMed Pharmaceuticals progresses. For reference, our previous expectations are detailed later in this note. Mereo BioPharma had net cash of £36.9m at H118, with a further £8.2m R&D tax credit received in August; at the prior forecast cash burn this translates to a runway through to late-2019. As discussed in our Initiation note (September 2018), the acquisition opportunities that are presenting themselves suggest that a strengthening of the capital base is warranted. Mereo BioPharma’s strategy deliberately targets programmes at the later clinical stages, eschewing earlier stage programmes, where the risk profile tends to be lower. However, albeit reduced, the typical industry risks associated with clinical trial results, navigating regulatory hurdles, ensuring sufficient financing is in place, partnering discussions and, eventually, pricing and commercialisation still apply. Our main sensitivities are detailed later (in the body of the note), with particular emphasis on each individual programme. Mereo BioPharma aims to develop and commercialise a portfolio of rare disease therapies, which have been acquired from larger drug players. Currently the portfolio consists of four programmes: two that target significant niche segments and two for Orphan Drug indications. The simplicity of the approach belies the strength and depth of in-house expertise in place to execute the strategy successfully. The proposed combination with NASDAQ-listed OncoMed Pharmaceuticals would, in our view, hasten progress in achieving the goal of becoming the partner of choice for such projects. There are several value-inflection points approaching, both in terms of clinical results and corporate events. Pending completion, our forecasts and valuation are under review: our prior valuation (based on an rNPV model) was £510m, equivalent to 615p/share. Mereo BioPharma was created to exploit the opportunities that regularly present themselves as promising clinical programmes within an originator company are de-emphasised. The reason could be product-related, for instance a failure to demonstrate the desired clinical profile in a commercially large and competitive therapeutic area, or it could merely be a change in research priorities as management (often new) refines its visions, goals, and objectives. Typically, such clinical assets have had significant effort expended and investment made, resulting in extensive supporting data packages and robust intellectual property; yet they now languish aimlessly within the originator’s development pipeline. The maiden deal was struck with Novartis in 2015 and covers three clinical assets that had fallen victim as Novartis reviewed its strategic direction. The programmes are: BPS-804, in Phase IIb for osteogenesis imperfecta; BGS-649, completing Phase IIb for hypogonadism in obese men; and BCT-197, which has completed Phase II to reduce acute exacerbations in COPD. In exchange, Novartis received initially 3.85m shares for 19.5% of the equity, with a subscription agreement for additional shares. In 2017, MPH-966 was licenced-in from AstraZeneca; it is in Phase II for countering the damage caused by excess neutrophil elastase in α1-antitrypsin deficiency. The deal is structured such that MPH-966 can be acquired once its value is demonstrated by the trial data. Management’s intention is for Mereo BioPharma to become the natural partner for any originator company that is seeking to realise value from its non-core niche clinical assets. The operational structure is in place and its abilities, both in-house and through collaboration, are increasingly being recognised. Mereo BioPharma’s clear focus is on in-licensing products for the treatment of rare diseases in respiratory, bone/musculo-skeletal or endocrine indications, with the aim of developing and marketing the products themselves. The next 12 months should see a series of trial results that will help validate Mereo BioPharma’s approach. For us it is the simplicity and scalability of the concept that has such appeal. The proposed combination with OncoMed Pharmaceuticals brings a NASDAQ listing, knowledgeable investors, a US office and staff, and additional clinical programmes. We view this as a natural next step as it allows not only greater access to funds for future deals when required but, notably in our view, helps raise the company’s profile in the important US market, where a sizeable number of its target companies are based. The proposed combination with OncoMed Pharmaceuticals was announced in December 2018. This will see Mereo BioPharma issue approximately 23.7m new shares, in the form of ADRs, to effectively acquire OncoMed for a total consideration of $57.4m (based on the Mereo share price of 190p at close on 4 December 2018), representing a 34% premium to OncoMed’s market cap of $42.9m on 4 December 2018. The transaction achieves a number of Mereo BioPharma’s strategic objectives: the cash resources extend its runway into 2020; the NASDAQ listing will help raise its profile in the US (aiding potential future fund raises and deal flows); it provides an experienced development and regulatory infrastructure; more opportunities for partnering; and finally, the additional ADR shareholders should help boost liquidity. OncoMed Pharmaceuticals is focussed on developing highly novel anti-cancer agents, with three programmes currently in Phase I trials. It was founded in 2004, and raised a total of $774m, made up of $400m collaboration funding from major pharmaceutical partners, $373m in equity financings, and $1m in grants. OncoMed had long-standing relationships with GlaxoSmithKline (GSK), Bayer, and Celgene, but these fell away in a series of high-profile disappointments. In April 2017 Bayer walked away (after paying $90m in upfront fees) from the first-in-class Wnt pathway inhibitors vantictumab (anti-Fzd, OMP-18R5) and ipafricept (Fzd8-Fc, OMP-54F28). In July 2017 it was announced that, following its clinical trial failure, GSK had terminated its option over tarextumab (anti-Notch2/3, OMP-59R5), the last programme left in a collaboration started in 2007. 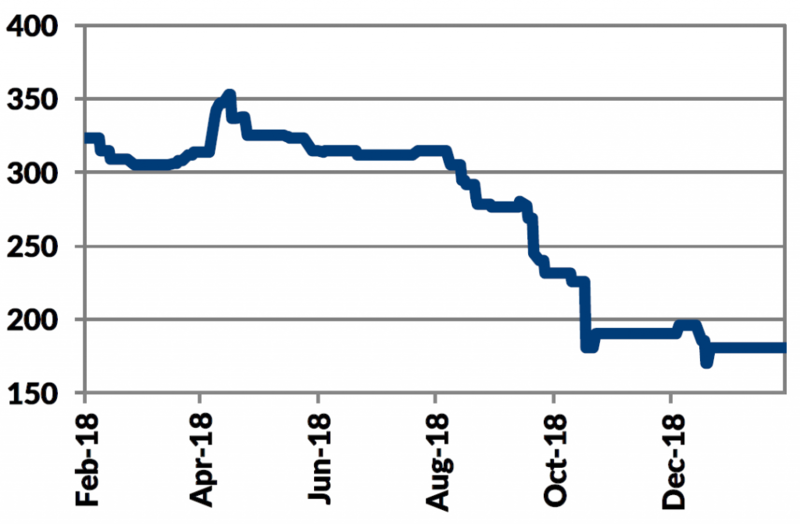 In September 2018 Celgene declined to exercise its option to license navicixizumab (anti DLL4/VEGF bispecific antibody, OMP-305B83), but retained its options to etigilimab (anti-TIGIT monoclonal antibody, OMP-313M32) and rosmantuzumab (anti-RSPO3, OMP-131R10). The remaining OncoMed clinical pipeline (Exhibit 2) will be progressed, with current studies likely completed from mid-2019, and partners actively sought. NAVI is an anti-DLL4/VEGF bispecific monoclonal antibody that targets and inhibits both Delta-like ligand 4 (DLL4) in the Notch signalling pathway and vascular endothelial growth factor (VEGF). NAVI offers the promise of anti-angiogenic plus anti-cancer stem cell and immunomodulatory activity, with a Phase 1a clinical trial showing encouraging activity and a clean profile. Two further Phase I studies, in metastatic colon cancer and in ovarian cancer, are underway. 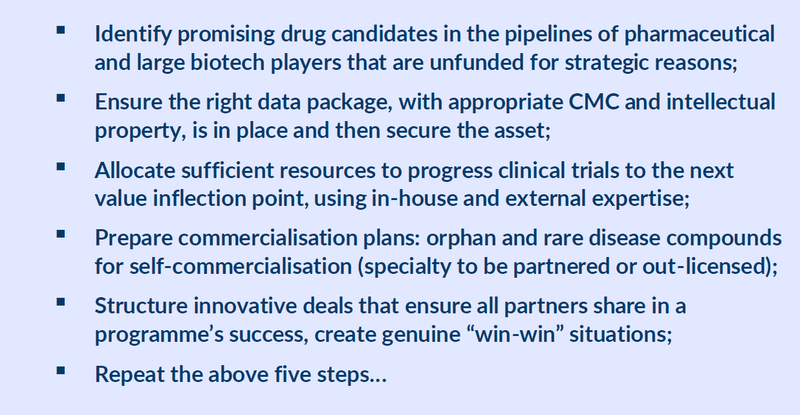 This is the programme that Celgene declined to op-in; OncoMed is awaiting Phase I data as it seeks other partners to develop it. Etigilimab is an antibody that targets the TIGIT (T-cell immunoreceptor with immunoglobulin and ITIM) domains, an inhibitory receptor that is thought to stop T-cells from attacking tumour cells in a similar manner to the PD-1 inhibitory protein. Preclinical models showed potent anti-tumour effects with a Phase I open label study in locally advanced and metastatic solid tumours underway. Celgene has retained its option over this programme, with a decision expected within 12 months. GITLR-Fc Trimer is novel engineered protein that targets the GITLR member of the tumour necrosis factor (TNF) family of ligands, and functions to activate the co-stimulatory receptor GITR (glucocorticoid-induced TNF receptor) to enhance T-cell modulated immune responses. It is currently in a 30-patient Phase Ia study in metastatic solid tumours to evaluate its safety and gain indications of efficacy. The trial is expected to complete in 2019. This programme is currently unpartnered. Rosmantuzumab (anti-RSPO3) was part of the original Celgene collaboration but disappointing results in a Phase Ib trial in solid tumour patients resulted in it being side-lined. No further development is currently planned. The NAVI element of the CVR refers to future progress in partnering the navicixizumab programme. 70% of the net proceeds of any cash milestone payments received by Mereo for five years post-completion will be received by OncoMed shareholders (subject to a cap of c$80m), with the balance retained by Mereo. Mereo BioPharma’s management will assume control of OncoMed on completion, with two current OncoMed board members joining an enlarged Mereo BioPharma board. OncoMed will become a US subsidiary of Mereo BioPharma and the head office will remain in London, with an operational facility in Redwood, California. OncoMed is targeting to have net cash of $38m at completion and around 23.7m new Mereo shares are expected to be issued, with an equivalent number of ADRs issued (on a 5 for 1 basis) via a newly created ADR facility listed on NASDAQ. The number of shares issued will be adjusted if the actual net cash varies up or down (with a protective reverse ratchet if cash is below $36.5m). The deal is anticipated to close in H119, with a final ownership split of approximately 75% Mereo:25% OncoMed. Mereo BioPharma’s current portfolio consists of four clinical assets, three from the original deal with Novartis and the fourth licensed in from AstraZeneca (Exhibit 3). The portfolio is well diversified, with each of the product candidates employing a different mechanism of action and targeting a distinct indication. The risks have also been contained by selecting product candidates that have already generated positive clinical data for the target indication or for a related indication. Further risk mitigation is through selecting a mixture of drug candidates, with some having novel modes of action and others having proven safety and efficacy albeit in a different indication. Comprehensive details for the individual elements of the pipeline are provided in body of the note. All the product candidates acquired have already received sizeable investment from their originator companies, and have substantial existing preclinical, clinical, and manufacturing data packages. Aside from the risk reduction aspects mentioned, the ready availability and quality of this data helps with the regulatory processes and any partnering or out-licensing activities. There is also a solid intellectual property estate attached to each product, with additional defences added as appropriate (for instance Orphan Drug status). Mereo BioPharma has the global commercial rights to all the product candidates. Mereo BioPharma has ensured that a comprehensive portfolio of patent families is in place. This not only arises from the original asset owner but, subsequent to purchase, additional patent applications have been filed wherever possible. Currently there are around 350 issued patents, with a further 81 or so patents pending. The primary patents range in expiry dates from 2024 (MPH-966 for NE inhibition and BCT-197 composition of matter) to 2032 (BGS-649 in hypogonadism), however all four programmes may obtain Supplementary Protection Certificates (SPCs) or term extensions that add a further five years of protection. 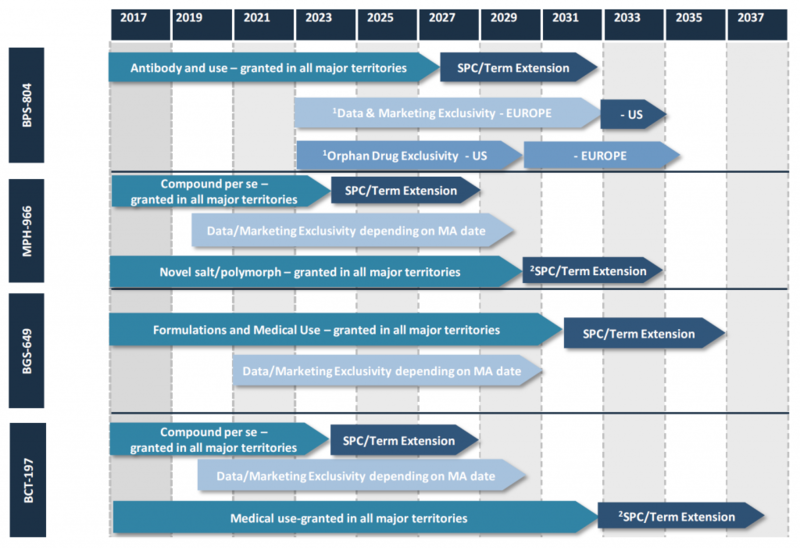 The expected dates of the primary protection and various additional marketing exclusivity periods is shown in Exhibit 4. Over the next section we detail each of the four clinical programmes, and the expected news flow associated with them is listed in Exhibit 5 overleaf. On top of the clinical data from the small trial in OI conducted by Novartis with BPS-804, Mereo BioPharma has also shown in preclinical models of OI that BPS-804 increases bone mineral density (Exhibit 6). In May 2017 Mereo BioPharma initiated a c 112 adult OI patient, double-blind, placebo controlled Phase IIb clinical trial (ASTEROID) in the US, Europe and Canada. The patients are Type I, III, and IV with the defect in COL1A1/2 gene confirmed by genetic testing, and which account for c 80% of OI patients. Recruitment, despite the complex logistics (eg standardising transport for such delicate patients) to 27 specialist sites, completed on track, in October 2018. There are three double-blinded, active arms, evaluating differing intravenous doses (low, mid, and high), and one open-label arm at the top dose, which was initially the placebo arm before the study was amended in August 2018 to assist recruitment into the study. The primary endpoint, measured at twelve months, is changes in trabecular volumetric bone mineral density (tvBMD) measured by high resolution peripheral quantitative CT (HRpQCT) and changes in bone strength on finite element analysis (FEA). Secondary endpoints include: tvBMD measured by HRpQCT at six months; BMD measured by traditional two-dimensional dual-energy X-ray absorptiometry (DXA); additional measures of bone parameters on HRpQCT; bone turnover markers and quality of life scores. The open-label study is expected to post its 26-week data in mid-H119 and 52-week data in mid-H219; the results from the blinded dose ranging part of the study are expected in Q419. In the US, the FDA has thwarted plans to include US centres in this pivotal Phase IIb/III trial in children so far, citing possible cardiovascular safety concerns with sclerostin inhibitors that were likely flagged by romosozumab in the ARCH trial. Pending an expected rapid resolution of the issue, the clinical trial for BPS-804 in adults with OI in the US is still proceeding and there is the potential to include US sites into the planned paediatric study in the EU and Canada in due course. In January 2019 the FDA Advisory Committee for Bone, Reproductive and Urologic Drugs voted 18:1 in favour of approving romosozumab (Amgen/UCB’s Evenity) for the treatment of postmenopausal women with osteoporosis at high risk for fracture. It was also recommended that Amgen conduct a post-approval observational study to further assess the cardiac risk. The favourable decision largely removes a major uncertainty that was clouding not only romosozumab’s commercial prospects, but was impacting sentiment for the whole sclerostin class. As background, romosozumab is the first-in-class sclerostin inhibitor and is being evaluated as an anabolic bone former in osteoporosis. A Marketing Authorisation Application (MAA) was submitted to the European Medicines Agency (EMA) in January 2018, supported by three Phase III trials: FRAME including 7,180 postmenopausal women with osteoporosis; ARCH including 4,093 postmenopausal women with osteoporosis at high risk for fracture; and BRIDGE including 245 men with osteoporosis. In July 2017 the FDA rejected Amgen’s Biologics Licence Application (BLA) for romosozumab, issuing a Complete Response Letter (CRL). In July 2018 the BLA was resubmitted with additional analysis of the data (with ARCH included) from the three Phase III studies. At the moment there is no definitive answer as to why there was such a disparity between the placebo-controlled FRAME study and the alendronate active control ARCH study. There is a school of thought that the difference could be accounted for through a cardio-protective effect seen with alendronate treatment but, as yet, that remains unproven. The FDA Advisory Committee recommendation for the approval of romosozumab should clear the way for Mereo BioPharma to discuss the further development BPS-804 in the US with the FDA. This is particularly the case as the clinical profile for a product in osteoporosis is quite different to that of a drug in OI, and there are also fewer treatment options in OI. It is likely that Mereo BioPharma will look to engage with the FDA again once it has the initial open-label six-month data from Phase IIb trial with BPS-804 in OI. Osteogenesis imperfecta (OI) is a debilitating disease for which there is currently no FDA or EMA approved treatment. Therapy is aimed at preventing and treating fractures, maintaining individual mobility, and striving to strengthen bones and the supporting muscles. Surgical procedures, such as rodding (the insertion of metal rods in the bones), have shown benefit but carry the risks associated with such major surgery. Medication typically involves the use of anti-resorptives (off-label use) such as bisphosphonates to ameliorate bone mass. Other treatments used in osteoporosis have been evaluated clinically, but with limited reported results. MPH-966’s mechanism of action appears particularly well suited to negating the impacts of α1-antitrypsin deficiency (AATD). AATD is a relatively common inherited genetic disorder where the liver produces an abnormal version of the AAT protein or none at all. Depending on its composition, the rogue AAT cannot pass into the bloodstream and its accumulation in the liver can lead to damage, typically identified through the jaundice produced. Normally AAT plays a protective role in the lungs and it is the abnormal version’s unavailability or the absence of AAT, and hence lack of effective inhibitory activity, that can allow the destructive effects of NE to go unchecked. Mereo BioPharma has initiated a proof-of-concept Phase II study, dosing the first patient in November 2018. The trial will enrol around 165 severe AATD patients with the PiZZ or NULL genetic mutations. These mutations are associated with more severe disease due to low (PiZZ) or zero (NULL) alpha-1 antitrypsin levels. The trial will last 12 weeks and consist of three arms (placebo and two MPH-966 doses); it will examine elastin breakdown and biomarkers of NE inhibition. Desmosine, a breakdown product of elastin that can be reliably and reproducibly measured and a good biomarker for lung damage, will be a primary end-point. Secondary end-points such as plasma Aα-Val360 (a validated biomarker of NE activity), NE levels in sputum, and a battery of lung function tests will also be included. The top-line results of this study, expected in H219, will guide the design of the pivotal Phase III trial. The MPH-966 programme is also supported by a newly announced collaboration with The Alpha-1 Project (TAP), the venture philanthropy arm of the Alpha-1 Foundation. Subject to meeting agreed development milestones (the first being the dosing of the first patient in Phase II), Mereo BioPharma will receive investment from TAP; and subject to these investments being made, Mereo has also agreed to issued warrants to TAP on future dates. Being an inherited genetic disorder AATD is a suitable candidate for gene therapy. Adverum Biotechnologies, a NASDAQ quoted US company, was exploring its lead programme, ADVM-043, through Phase I/II trials as a single-administration treatment to induce the long-term production of stable AAT protein. The attraction is that, once treated, the patient would continue to produce normal levels of the correct form of AAT. Unfortunately, whilst the doses were safely administered and well tolerated, the protein expression achieved was not clinically meaningful and the programme was terminated. Clearly, gene therapy remains an experimental, and expensive, option. Novartis undertook a comprehensive early clinical evaluation, with BCT-197 the subject of three Phase I and two Phase II studies, involving a total of 498 treated patients, that showed a clean side-effect profile and promising anti-inflammatory activity. An exploratory Phase II trial examined 183 AECOPD patients in a four arm parallel format looking at one 20mg or one 75mg oral dose on Day 1 and one 20mg or one 75mg oral dose on Day 1 and Day 6 of the exacerbation episode. The results were presented at ATS 2017 (American Thoracic Society) in May 2017. Unsurprisingly, the two-day regimen at the higher 75mg showed the best response, with a statistically significant improvement in FEV1. Dose-dependent improvements in markers for AECOPD were seen, as was a reduction in hospital stay, but statistical significance was not reached. No safety concerns were noted. The results and experience were used to design a larger Phase IIb study (AETHER) that Mereo BioPharma undertook. 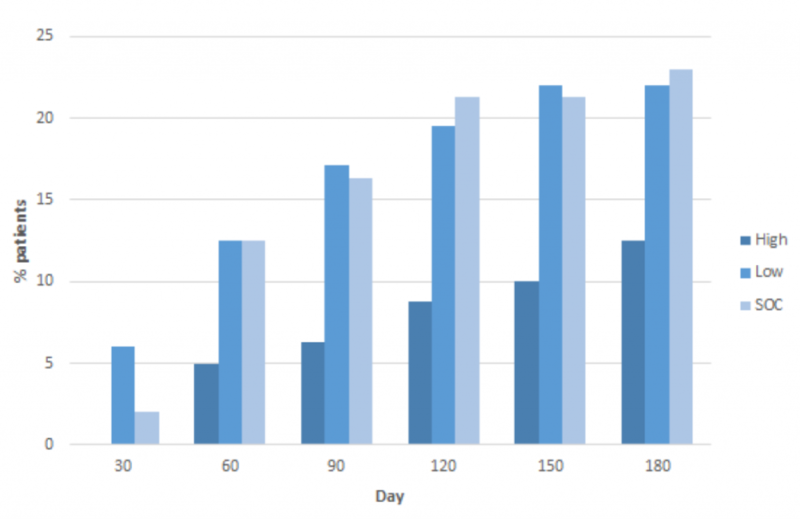 This involved 282 patients with two different dosing regimens (high and low dose) of three doses over five days versus placebo, on top of standard of care (including steroids, antibiotics, and bronchodilators), over a five-day dosing period. Patients were then followed for 26 weeks. The primary endpoint was FEV1 (forced expiratory volume in one second), with several additional endpoints including hospital stay times, patient reported outcomes, recurrence rates of AECOPD and hospitalisations. It should be noted that these patients tend to already be on maximal bronchodilator therapy. There was also a significant reduction of more than 50% in clinical treatment failures (as defined by the number of re-hospitalisations for treatment of COPD) at days 90 through 150 in patients treated with the high dose of BCT-197 compared to the low dose or placebo (p≤0.027 to 0.05, Exhibit 7 overleaf). Interestingly, the greatest impact with both low and high doses was seen in the severe exacerbation group (more than two exacerbations per annum), suggesting that the patient group with the greatest clinical need may benefit the most from BCT-197 treatment. A Phase IIb study saw a total of 271 patients allocated into a four-arm (low-, intermediate-, high-dose, and placebo) double-blind protocol over 24 weeks with a 12-week follow-up. The study was performed in the US and Europe and top-line results were published in March 2018. The primary endpoint of normalising testosterone levels in over 75% of patients was met at all dose levels, with the secondary endpoint of achieving this normalisation in over 90% of patients met at the two higher levels (the lower dose was trending towards but failed to achieve statistical significance, Exhibit 8). All three doses also met the other secondary endpoints, including significant improvement in FSH and LH levels. Total sperm motility and levels of fatigue also improved. There was no overshoot in testosterone levels at any dose, so confirming that the normal feedback mechanisms remained undisturbed. A six-month extension study, involving 143 men, presented results in December 2018. This aimed to provide additional safety and efficacy data and showed a clean safety profile with no unexplained side-effects. Neither primary nor secondary safety endpoints were breached (including no significant reduction in BMD at the pre-determined level of 3% on lumbar spine BMD) and the data corroborated the experience from the existing trials data. Importantly, all three doses achieved both primary and secondary efficacy endpoints (normalisation of total testosterone levels in 75% and 90% of patients respectively). Similarly, all three doses achieved all other secondary endpoints. These positive outcomes will guide the future development programme. BGS-649 is not a programme that Mereo BioPharma would commercialise itself. The question now is whether it undertakes the pivotal Phase III trial itself and then seeks a partner, or whether the partner is brought in earlier and shares in the last stages of development too. For our modelling we have assumed that BGS-649 would complete the Phase III registration studies in early-2020, regulatory submission in 2023, with a probable first approval, and launch, in 2024. BGS-649 could become a major blockbuster due to the rising levels of obesity in many countries, however most obese men are unaware that they have testosterone deficiency, and it is a competitive market. Thus, we have forecast relatively modest peak sales of $483m (£372m). BPS-804 is approaching a defining moment as a pivotal Phase IIb study in adults with osteogenesis imperfecta (OI) nears fruition and a similarly pivotal paediatric Phase IIb/III study in Europe and Canada is initiated. The outcome of the FDA’s review of Amgen’s romosozumab is a high-profile determinant of the eventual commercial acceptance of sclerostin inhibitors as a class in osteoporosis; however, in our view, it is not likely to be a major factor in the more debilitating and poorly served OI setting. MPH-966 has recently started a proof-of-concept Phase II trial in patients with severe AATD. A positive outcome is a necessary prerequisite to continue development, but it can be appreciably difficult to demonstrate clinical significance in such respiratory disorders within the time and structural constraints of a clinical study. Similarly, the endpoints and biomarkers selected may not reflect the full extent of its activity. BGS-649 has produced strong initial results from the Phase IIb study in HH, which the follow-on 6-month safety study has corroborated and strengthened. The next stage will be to seek a commercialisation and/or development partner. The potential market for BGS-649 is large, given the level of obesity in many countries. However, it is a challenging market with established competitors, and any marketing campaign would need to educate primary-care physicians about testosterone deficiency and raise awareness among patients. As discussed earlier, whilst the proposed OncoMed Pharmaceuticals transaction progresses we have suspended our forecasts and valuation. However, for reference we have included our previous valuation and description of the detailed methodology employed. We valued Mereo BioPharma using an rNPV model of the four clinical programmes, which are then netted out against the cost of running the business and net cash. The rNPV of each individual clinical project is assessed and the success probabilities adjusted for the inherent clinical, commercial, and execution risks each carries. These are summed and netted against the costs of running the operation and net cash. The success probabilities are based on standard industry criteria for the respective stage of the clinical development process but are flexed to reflect the inherent risks of the individual programme, the indication targeted, and the trial design. We also factored an element for the execution and commercial risks, notably on the two programmes earmarked for partnering. As always, we employ conservative assumptions throughout our modelling, particularly regarding market sizes and growth rates, net pricing, adoption curves, and peak market penetration. Previously, our model (Exhibit 9) resulted in a valuation of £510.3m, or 615.4p/share on a fully diluted basis, for Mereo BioPharma. Looking at the elements of our prior valuation in greater detail: BPS-804 was the largest component of the valuation, amounting to £326m, equivalent to 458p a share. We have assumed first material sales will occur in 2023, with peak sales of $735m (£566m) occurring some 6 years later with an operating margin of 60%. We employed a 50.0% probability that it will successfully complete its clinical trials and reach the market. We view BPS-804 as being well suited to self-commercialisation by Mereo BioPharma, so have factored in appropriate costs for marketing, offset obviously by a greater retention of the revenues. Although the precise terms of the payments to Novartis are not known, we have assumed c 10% is paid away in the equivalent of royalties. Our model showed MPH-966 to be worth £62m equivalent to 87p a share. We based this on a first market launch in 2024, peak sales of $420m with an operating margin of 65% being achieved, and a clinical success probability of 25.0%. 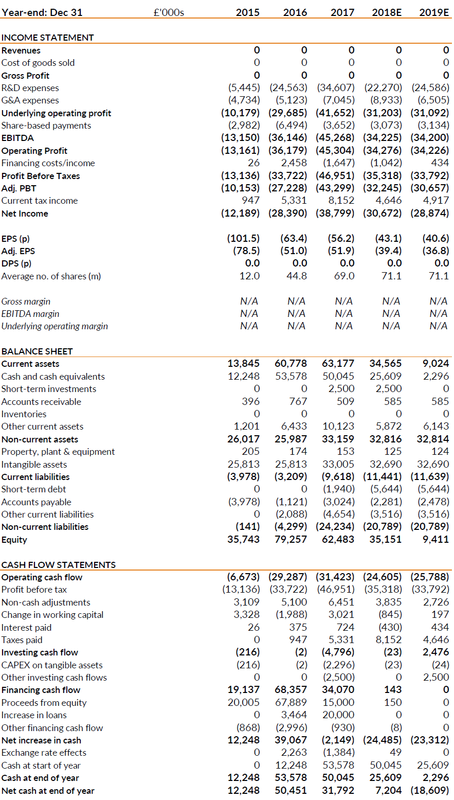 MPH-966 is also a product well suited to self-commercialisation, hence we used similar financial assumptions to BPS-804, with a royalty equivalent rate of c10% of revenues payable to AstraZeneca. We had a higher gross margin assumption with MPH-966, compared to BPS-804, because it is a small molecule and not a monoclonal antibody. Although BCT-197 has the largest sales potential, with peak sales of $768m following a first launch in 2023, and a clinical success probability of 60%, our valuation is £89m, equivalent to 125p a share. This again reflects the dynamics of out-licensing versus a self-commercialised product. We used a success probability of a suitable deal taking place of 70% in 2019, with Novartis receiving 20% of any upfront or milestone payments and Mereo BioPharma achieving net royalties of 10% (after royalties payable to Novartis). We conservatively estimated that Mereo BioPharma will receive a $20m upfront, a $30m milestone payment on filing and $50m on approval. BGS-649 was valued at £23m, equivalent to 32p a share. Here the first market launch occurs in 2024, peak sales are $483m, and the clinical success probability is 50%. To take into account the risks associated with partnering the asset, we conservatively assigned a success probability of 50% that this happens in 2020. We estimate that Mereo BioPharma will receive a $10m upfront, a $15m milestone payment on filing and $30m on approval, and thereafter net royalties of 10% (after royalty payments to Novartis). We openly admit that we employed conservative assumptions throughout our modelling. It is important to note that any number of incremental improvements on our base case scenarios could result in material uplifts in our valuation. Equally importantly, the visibility for the outlook of all four clinical programmes is increasing, with a rich news flow over the coming years. This suggests that there is significant upside potential, with multiple catalysts expected in the next 6 to 24 months. As stated previously, we have suspended our forecasts and valuation for Mereo BioPharma as the proposed combination with OncoMed Pharmaceuticals progresses. For reference we have reproduced our previous forecasts and descriptions of our expectations below. Looking ahead, we expected the investment in R&D to have fallen by 36% to £22.3m in FY18 as there were limited costs associated with BCT-197 and there were significant CMC (chemistry, manufacturing and controls) related expenses for BPS-804 in FY17 which are not repeated in FY18. In FY19, R&D expenses were forecast to grow by 10.4% to £24.6m due to the extra costs associated with the Phase III trial with BPS 804 and Phase II trial with MPH-966 more than offsetting the reduced investment in the other two programmes. Administrative expenses were expected to increase by 27% to £8.9m in FY18. This was largely driven by the costs associated with the preparations for listing on NASDAQ. In FY19, these expenses were expected to fall by 27% to £6.5m, which reflected the core operating costs for the company. As at June 2018 Mereo BioPharma held a cash position of £36.9m, with a further £8.2m received in August as the R&D tax credit relating to FY17. This was expected to enable the company to operate to the end-of FY19, prior to the proposed combination with Oncomed Pharmaceuticals. We had stated previously that Mereo BioPharma has sufficient funds to execute its short-term plans, but will, in our view, need extra capital to fund the pivotal Phase IIb/III study with BPS-804 in children with OI and take MPH-966 to market (including milestone payments to AstraZeneca). We also said that a reasonable cash cushion would also be helpful in enabling Mereo BioPharma to move quickly in funding additional development programmes, when it comes across interesting assets for acquisition or in-licensing. We believed management could raise significant funds from the out-licensing of BCT-197 and BGS-649 as well as from the issuance of equity. Clearly the proposed combination with OncoMed Pharmaceuticals will bring in additional funding and potentially addresses the points raised above to some extent. Management is targeting to have net cash of $38m at completion and around 23.7m new Mereo BioPharma shares are expected to be issued. It is worth noting that the number of shares issued will be adjusted if the actual net cash varies up or down (with a reverse ratchet if cash is below $36.5m). We intend to review our forecasts and expectations as soon as possible following deal closure.